When it comes to reading the Bible, it should be rather simple. I mean, they say that the NIV is written at a 7th grade reading level, the ESV at a 10th grade level, the HCSB at an 8th grade level, and the Message at a 4th grade level. 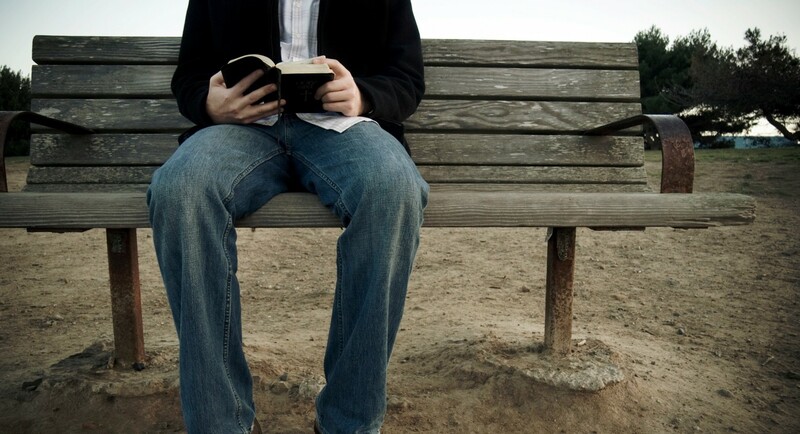 If you know how to read, reading the Bible is…simple, right? For most of us, I would bet we feel overwhelmed most of the time when we pick up that leather-bound copy. If it doesn’t have study notes in it or we don’t have our phone or computer nearby to consult blogs and commentaries, things are going to be pretty rough. Maybe you feel more comfortable reading when someone like Rob Bell explains what is going on behind the scenes. Once they explain the metanarrative behind the Scriptures, you see everything in a new light, and it makes sense. You feel handicapped because you don’t have the same grasp of historical events and details that aren’t found in the Bible itself, and you find yourself constantly turning to others to explain what is really happening behind the text. There are others who are so afraid of misinterpreting a verse that they constantly consult commentaries by well-known church figures like John Calvin, Matthew Henry, or John Gill before they can feel confident they have rightly understood the passage. You know you have the same Holy Spirit that Calvin and Henry have, but can you really be so sure that you are reading the Bible correctly? Historical background can be helpful at times, and certainly Calvin and the host of great commentators of church history are a gift to the Church. However, I want to convince you, Christian, that you can read the Bible and understand the Word of God. Step #1: Read the Bible. This sounds basic, but the best way to understand the Bible is to read it. Over and over and over again. I would bet that you–like me–struggled to understand Shakespeare in high school. Let’s be honest: Did reading those Cliffs Notes really ever help us actually understand the words of a Shakespearean play? Of course not. Cliffs Notes do all of the hard–and rewarding–work for you, and you never learn to read Shakespeare for yourself. Every time you sit down to read Macbeth, or King Lear, or A Comedy of Errors, you have to have your companion Cliffs Notes to explain it all to you. The best way to understand Shakespeare is to sit down and read it. It’s the exact same way with the Bible. If you expect to understand the Bible, you need to put in the hard work of reading it, Genesis to Revelation, over and over again. I think this is probably the biggest obstacle to understanding the Bible for ourselves is that we don’t want to do the disciplined hardwork of actually reading God’s Word. The words of a blog post are not “perfect, reviving the soul” (Psalm 19:7). The words of the Bible are. The Psalmist wasn’t speaking about a commentary when he wrote “they are more to be desired…than gold, even much fine gold; sweeter also than honey and drippings of the honeycomb” (Psalm 19:10-11). Only the Bible contains the words of eternal life. Read the Bible. Nothing has better equipped me to understand the Bible over the course of my life than the Bible itself. Step #2: Start with Intratextuality. The next time you don’t understand a verse or a story or a teaching in the Bible, just stop. Put the phone down. Shut the laptop. The first place you should turn is not your commentary library. Turn to the immediate context. Did you read the rest of the chapter? Did you think to read the rest of the book? Intratextuality refers to the connections within a book of the Bible. If you read a verse and it doesn’t make sense, the best places to look for help are the context clues surrounding it (you probably learned this in like fifth grade). These days, people read a chapter from this book of the Bible, a verse from that book of the Bible. Can you imagine reading one chapter out of the middle of The Brothers Karamazov one day and then reading one chapter out of the middle of Adventures of Tom Sawyer the next? Would it make any sense? At that rate, how many more chapters from a new book each day do you think you would read before you quit altogether? When was the last time you read the Gospel of John all the way through or the book of Isaiah from start to finish? Intratextuality realizes that authors have a story to tell. They develop their own themes, motifs, characters, and plot. The best way to understand a verse or a specific passage is to read the rest of the book, and let the author develop his own ideas, themes, and narrative. Step #3: Move to Intertextuality. The sixty-six books of the Bible are not disparate accounts. They fit into a greater narrative–a metanarrative–of who God is and what he is doing. Each author in Scripture understood that he fit into the greater story of God’s people, and he wrote in view of what God had already revealed. What I mean is, Isaiah knew Genesis, Exodus, Leviticus, and so on, and his book connects to these books that came before it. Matthew writes in view of the entire Old Testament. Paul’s letters connect to the Gospel accounts, Acts, and the Old Testament. On top of this, 2 Peter tells us, “No prophecy was ever produced by the will of man, but men spoke from God as they were carried along by the Holy Spirit.” Every book of the Bible has two authors–one Divine and one human. The Holy Spirit threaded connections through the entire 66 book canon. So, after you have read the immediate context of your passage, look for connections in other books. This is what we call intertextuality. I preached on Psalm 95 this week. I spent a long time studying, reading, and re-reading. However, when I finished meditating and thinking on the verses of the Psalm, I was able to turn to Hebrews 3 and 4, where the author specifically explains the significance of Psalm 95 for Christians. This is the benefit of intertextuality. You may not always have such a direct connection, but chances are that even the shortest of passages will have at least one connection to another book of the Bible. Step #4: Finish with Extra-textuality. This is the LAST step. Not the first. One of the unfortunate things about some commentators and preachers is that they begin here when this is where you should finish. After you have put in all of the hard work reading and re-reading the surrounding context of a verse, and after you have looked for connections in the rest of God’s Word, then consult extra historical background information. Honestly, if you get steps 1-3 right, you may not even need step 4 95% of the time. Step #5: Talk to other Believers. The Word of God was given to the people of God. 1 John tells us that “If we walk in the light, as he is in the light, we have fellowship with one another, and the blood of Jesus his Son cleanses us from all sin” (1 John 1:7). When you become a Christian, you enter into fellowship with every other believer in the history of God’s people. The same Spirit who is leading you to truth is also leading your brothers and sisters into that same truth and has been leading God’s people to grow in wisdom and understanding for generations and generations. Talk to those brothers and sisters about the Bible. Read books by those who went before you. Have the humility to allow the Spirit to steer and guide your understanding of Scripture through the reading and experience of your brothers and sisters in Christ. The fellowship of other believers is a gift to you. They are meant to help keep you on the lighted path along our pilgrim journey. You can do it! You don’t need a whole book bag of books or a computer screen to read the Bible. Get in those pages and hear the voice of God. Read it. Reread it. Be okay with not understanding every word. Trust that Jesus’ promise shall not fail: “The Helper, the Holy Spirit, whom the Father will send in my name, he will teach you all things and bring to your remembrance all that I have said to you” (John 14:26). And remember: Christ is the center of the Bible. Everything–whether Old or New Testament–connects to Him.